My new word discovery, starrify. I found a cool link to some ultra-hip words on Save the Words - on a link posted by Angela from Striking Keys recently. I LOVE the meaning - to decorate with stars, and the sentence that is used to show how it could be used in conversation is hilarious! And I even found a great example - the mosaic bowl starrifies the ceiling every time the sun comes out! Adjusting to daylight savings. A long overdue night out with daycare parent friends for dinner and not home till midnight (1am adjusted for daylight savings) + Noah having a friend to sleep over and the 2 chirpy early birds getting up at 6.30 (5.30am not adjusted for daylight savings) = A recipe for next to no sleep and 2 very tired parents! Needless to say, Sunday was a very quiet day for us! Little brown mouse. Meese. Mice. Whatever! A cute hat sent over from Grandma & Grandad in the UK that fits both boys..just. When Mark suggested they could pass for Ewoks I knew we'd been watching far too much Star Wars in this house lately! It doesn't make me any happier when I read that starlings are considered a pest in NZ and the species they come from is known as vulgaris...sigh..........does anyone have a pop gun I could borrow? The flexibility this boy has. I think he gets this pose from me. I can still sit like this...for a few minutes anyway before the old joints start to complain. And him? He can sit for hours like this. Got to love those genes. I'm just stoked that he didn't inherit my hair twirling gene thus far. Only a girl could really get away with that one! having an itchy scalp. And no, I don't have nits! I've had it on and off for about 3 months, and some days it's worse than others. I've been using sensitive shampoo and conditioner (which cost a fortune by the way! ), but it just isn't going away. I might have to look into some 'erbal remedies and see if they might help. I think it is more than likely stress related as it does tend to flair up when I've got a lot on. I'm not silly enough to believe that this working full-time and being a mummy-of-two lark was ever going to be a walk in the park! Putting on a brand new pair of work pants this morning and finding a giant hole in the crotch. OK, so they were only $10 down from $40 but they didn't mention anywhere that they were damaged. Grr. Thankfully, my limited sewing skills do stretch to the odd bit of mending on the fly. Off I went to work as good as new! Little boys' imaginations. This pirate treasure map of Dinosaur Island drawn very carefully, joining all his own dots and with the prerequisite 'X' marks the spot. Very Jurassic Park! That our camera needs to be sent away to be looked at. It has been saying 'Change the battery pack' even with a full battery. Best send it off now though so we have it back by Christmas. Eek, did I really say that.... Christmas is well and truly coming when it starts getting mentioned in conversation. A helpful Harry in the garden. Each year, his ability to help rather than hinder grows. What things are you loving...not loving....lately? awwwwl Thankyou muchly!! :) love reading yours too! What a lovely list Meghan!! I love your starrified celing!! LOL. And that Dino treasure Map - that is a Keeper. Daylight saving has so far been kind to us too... I'm loving the scent of the garden in spring, morning and evening. Intoxicating! With regards the itchy scalp thing - I have the same and I believe it is stress related. I've stared taking fish oil capsules (for omega) as I don't eat enough oily fish and cod liver oil for Vitamin a & d, which hopefully will help - as well as sensitive shampoo. 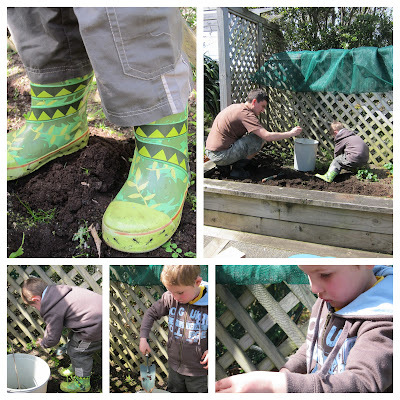 Loving the pics of the boys hard at work in the garden :) Our peas have sprouted and now I'm hoping we can keep them safe from bugs and wind! This post is dynamite. And not just because you are super-nice to me in it (thank you, THANK YOOOOOOOOU!). Where do I begin? The hat before/after...and the allusion to ewoks; dynamite. Using the word "starrify"; dynamite. Your gorgeous honesty - dy - na - MITE. /sigh You're great. 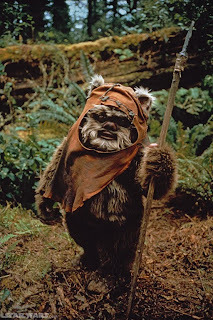 Loving your list - and loving the Ewok kids!! 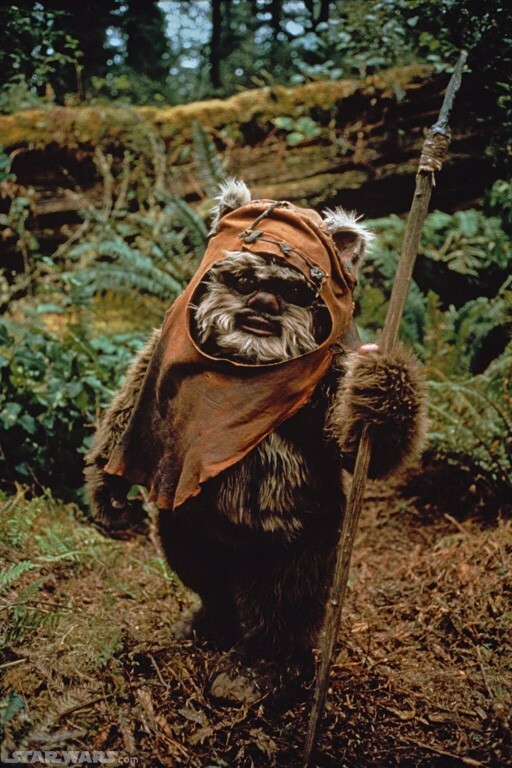 My brother was such a Star Wars fan so I have such fond memories of Ewoks! !